A lovely morning from Cairo, Egypt. A wonderful weather and picturesque scenery. For the third year consecutively, Sheraton Montazah Hotel Alexandria, joined millions around the globe, on March 23, in celebrating the Earth Hour by switching off lights for an hour from 8:30 pm. The hotel’s participation in this ecological event, which saved 330 KWH, about 47% of total energy, during this particular hour, is a continuation of its commitment to protect the environment not only for those who are currently living on earth but for also the many generations to come. Joining this global event was also to educate and create awareness about the importance of saving our planet. 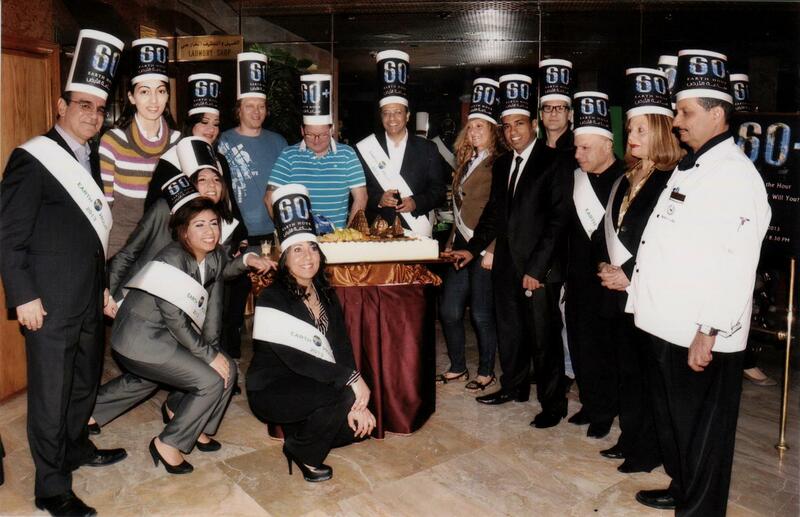 The Hotel’s team celebrating Earth Day. On this occasion, the hotel prepared a candle light dinner at the Café Coquillage and La Mamma Restaurant, where green cocktails were served as a special welcome to incoming guests as well as snacks that do not need energy to cook. A big banner showing the hotel’s efforts and initiatives for the environment was also displayed. As global warming has become one of the biggest challenges facing the world’s climate, Sheraton Montazah Hotel considered environmental protection as an extremely important issue. And in order to guarantee greater sustainability, the hotel has begun pursuing several green practices. As a result, the hotel was able to achieve 14 percent reduction in its carbon footprints from 2011 to date. For the adventurer with a taste for the serene, Lake Nasser fishing safaris are a bright spot in a sea of temples and ruins. 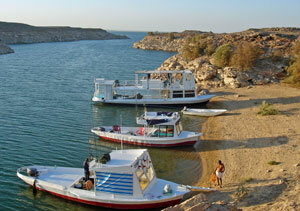 Have you ever considered spending the night on Lake Nasser in a fishing boat? Some travellers come to Egypt to do just that. No luxury hotels or air-conditioned buses here, just the symphony of nature and the unassuming splash of the lake’s abundant game. It seems that not all tourists come to Egypt to do the culture thing; some come just to enjoy nature — and they are prepared to rough it. While the devotion of those who delight in casting a line — often without success for hours on end — is something non-enthusiasts can never share, these are adventure travellers, and the lake is the limit of their holiday terrain. No matter if the day’s results are nothing more than a tale about the one that got away. This is a hobby, or even a passion, and having sampled the pristine beauty of Lake Nasser and its desert terrain, enthusiasts come again and again. Still predominantly a trip for die-hard anglers, tour operators are keeping their eyes on the trend with hopes that fishing safaris will flourish like other specialty tours, including desert safaris and deep-sea diving. Although fishing trips are not offered by most travel agencies, African Angler, an Australian company, is sampling the potential. It could take off as a tourist draw; it may generate limited interest. Either way, the trips have introduced a fresh alternative for travellers to Egypt who have either traipsed the Luxor colonnades enough or for whom a civilisation dead for thousands of years doesn’t raise an eyebrow. 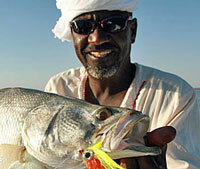 African Angler approached the governor and military officials in Aswan and was granted special permission to organise big game fresh-water fishing safaris. Like a desert or mountain-climbing safari, it’s not a trip you can go alone. Other than permission, you need transportation, provisions, professional guides, fishing and supply boats as well as sleeping bags and tents. “We are not near a hospital, we cannot call an ambulance, so we have to take care to stay in contact with one another. In case of emergency, we have radios and can communicate with the police in Aswan, or get the military if help is needed,” Baily said. Stretching between Aswan and northern Sudan, with some areas over 12 kilometres in width, Lake Nasser is one of the largest man-made lakes in the world. A controversial outcome of the construction of the High Dam in the 1960s, the lake now nurtures a vibrant aquatic life, including Nile perch, tiger fish and vundu catfish, making it a splendid venue for fresh-water fishing. “Most anglers who visit the lake for the first time will find themselves hauling in the biggest fresh-water fish of their lives,” said Baily. Big catches have made a name for the lake as having a lot of potential, explains Baily. 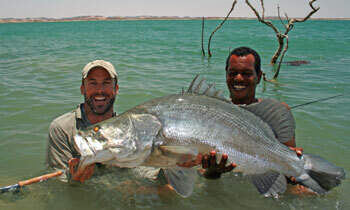 Two world records have been set at Lake Nasser, including a Nile perch weighing 213 pounds (about 97kg). When Larry Dahlberg, a famous American fisherman, went on a fishing safari with African Angler, he made a film about fishing on Lake Nasser. The safaris have also been featured on BBC2 and Thai television. For those interested in the details, a safari trip usually includes one supply boat and two specially equipped fishing boats that accommodate six to eight anglers. The supply boat carries all the required equipment, provisions, fuel and shore staff. With its own built-in kitchen, dining facilities and large ice boxes, the boat enables the group to set up comfortable camps on shore, close to the best fishing areas, even when the shore-line is rocky or inhospitable. “In effect, it is a moving camp,” Baily notes. Boat safari camp, mother ship and live aboard boats. Safari crew camp; guides – party time. The fishing boats are no luxury cruise vessel, but each has comfortable and functional on-board facilities, with two bunks enclosed by strong canvas tenting at night. In place of organised entertainment in the evenings, the only diversion is feeding left-overs from dinner to the animals that live around the lake. Pelicans settling in for the night, isolate islands are used to escape predators. A typical day on Lake Nasser involves getting up at first light for a couple of hours of shore-fishing, followed by breakfast, explains Baily. The boats then set off for a day of trolling and shore-fishing. Plovers competing for territory with a young crocodile. So, how successful are fishing safaris? Baily, who brings roughly 500 anglers from different parts of the world annually, believes that Lake Nasser has excellent potential. “Once anglers discover a good place to fish, they come back again and again,” Baily says, explaining that 47 per cent of his business is repeated business. But he concedes that there are a number of obstacles. If you want to know, or want your child to know, how the environment has influenced the farmer’s character, his life style, traditions, customs, tools, and ethnic dress in Egypt — then this culture garden at Mansouriya is the place for you and your family to visit. The Sun Bird garden in Mansouriya, south-west of Cairo near the Giza pyramids, is unlike any other garden. This is a place where you can not only enjoy nature, but also learn: how fruit and vegetables are cultivated and what their seeds and flowers look like. On this living museum of contemporary life one can also observe how farmers live, what their homes are like and the traditions and customs they follow. The display encompasses a glimpse of the life of all the farmers of Egypt, from the Nile Delta in the north to Nubia in the south. This “culture garden,” as its owner likes to call it, is a place where adults and children from at home and abroad can see the birds and animals which help the farmer in his daily life. Visitors can tour sections demonstrating such traditional crafts as pottery, weaving and the production of honey. The culture garden is divided into sections representing Egypt’s governorates, of which Fayoum and Sinai are particularly interesting. Here are illustrations of migratory birds and plants indigenous to the area, as well as examples of local traditional crafts and customs: wedding parties, the arrival of a new baby, and festivals — religious, social and folkloric. The name of the garden, Sun Bird, Sadiq says, is symbolic. This is the name given to a small bird which lives in the Nile Valley and flies from flower to flower, feeding on nectar. The bird’s bright colours of violet, yellow and green represent, it is said, the colours of the Nile, the desert and the rich green valley. In the garden this delightful bird, one of the main attractions, flies from tree to tree. The garden covers two feddans, and on every tree and plant is a sign, written in Arabic, English, French and German, providing information. 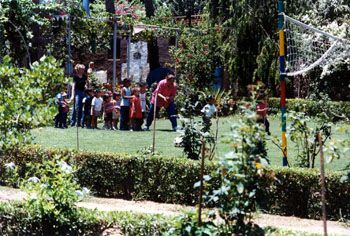 Guides show visitors round the sections of the garden, while small children can spend the time playing in a large green area. Older children can try their hand at cultivation or making pottery. As for adults, there are shady palms under which to sit and relax on mastabas (benches) covered with mats and cushions. As visitors enter Sun Bird they are served cold mineral water and other refreshments. Later, fatir (traditional pastry) is served hot from a baladi (country) oven by one of the farmers. This ambitious project is not run by a tourist company or a group of investors. It is owned and run by one enthusiastic woman, an ex-tour guide, with the help of a group of farm workers. They cultivate the land, bake the fatir and do the cleaning and maintenance. Sadiq herself designed all the sections into which the garden is divided, drew the maps and executed the paintings of the birds. Sadiq says that although all the fruits and vegetables grown in the garden are the same varieties as those on sale in markets and supermarkets, many people do not know how they grow or what they look like in their natural environment. They do not know which are indigenous to Egypt, whether they have become extinct and reintroduced, or whether they are imported. “Sweet potatoes, for example, are known worldwide, but the plant itself grows only in certain countries, including Egypt. Here is where people can learn such things. They have an opportunity to react with Nature and see how generous she is,” Sadiq says. No artificial fertilisers are used at Sun Bird, so there are no large, standardised tomatoes or green peppers. Rather, the produce comes in the shape that nature gave them, in various sizes, and in varying shades of colour. This applies to okra, regular potatoes, sweet potatoes, artichokes, aubergines, pumpkins and limes. “Artificially grown fruit and vegetables are sold at greengrocers and supermarkets. Here I want to show people the way they grow naturally,” Sadiq says. Traditional dress is always of interest, and on display here are galabiyas (loose gowns) from the different regions of Egypt — from the north coast, the Delta and Upper Egypt, to the oases of the Western Desert and Sinai. Here one can become acquainted with different traditions and customs concerning wedding celebrations: the bridal dress, the wedding feast, the contribution of the bride’s family to the marriage, the gifts of friends and the entertainment. “Pottery played an important role in Egyptian history. It was extremely important for utilitarian reasons. The clay used in pottery manufacture used to come from Qena or Aswan in Upper Egypt, and people in ancient times did not fire the pottery or use a glaze, as we do today: they dried the pottery in the sun and its natural colour survived,” Sadiq says. 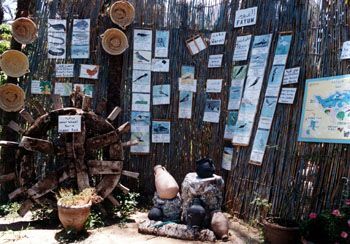 In the Sun Bird’s pottery section are examples of all the instruments used in its manufacture, including a foot-operated wheel. Also on show are cooking pots, butter or ghee pots, pickle pots and oil pots, along with pigeon houses and other items. Pottery chips are of great use to farmers, who put them on the roofs of their houses for the dual purpose of protecting them from rain and insulating them from the heat of the sun. Few people have the opportunity to enter a farmer’s home. This, then, is your chance to do so. You will notice that the door and the high windows are so designed to prevent passers-by from seeing inside. You can see the farmer’s brass bed, the oven in which his bread is baked, the plates from which he and his family eat, the oil lamp, the oil cooker and the pigeon cage. 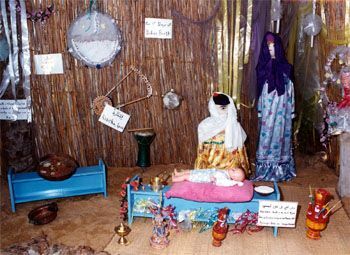 You can even look inside a home typical of the Ababde, a tribe of the south-eastern desert, which has its own distinctive features. “This place could be attractive to tourists at the end of an excursion, or for conferences, since businessmen also need to relax in a green space at the end of the day. 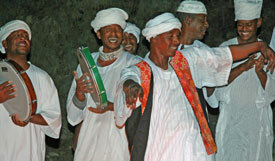 Here they will learn aspects of Egypt that they would not otherwise be exposed to,” Sadiq says. Sun Bird neither seeks nor needs wide promotion. “People tell one another about this place, and the word gets round. I also have a nice brochure which I distribute to schools and nurseries — that serves us well enough,” she says.